Students and leaders returned from a very successful service trip to the Trinity Yard School at Cape Three Points, Ghana on Saturday, April 7th. While in Ghana, the students set up a library that will serve Cape Three Points and surrounding communities for years to come. In addition, the group built a bike workshop for students, taught English at local schools and contributed to facilities improvements around Trinity Yard School. While in Ghana the students forged valuable friendships with their Ghanaian peers and gained life changing insight into the complexities of the world beyond the boarders of their own country. 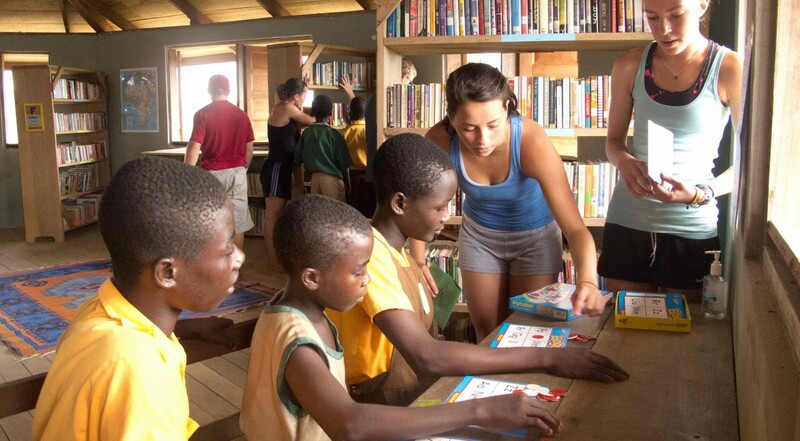 On March 21st, 2012, thirteen high school students and three leaders from Jackson Hole will embark on a community service trip to Trinity Yard School (TYS) at Cape Three Points, Ghana. Situated on the southern most point of the Ghanaian coast, TYS serves as a vocational school for high school aged students who have little or no other educational opportunities. The primary objective of the student trip is to create meaningful and sustainable change through service projects on the ground. The group will travel with school supplies, bike components, and good will in tow. This is the second journey from Jackson to Cape Three Points of this nature, and the group hopes to build on work accomplished during the 2010 trip. Previously, Jackson students helped construct a library building at TYS. During the upcoming trip, the group will help set up this library, creating an easy-to-use organizational and cataloguing system. Once completed, this will be the only library within a 100 mile radius and will be open to the public. In addition, the group is undertaking a project to teach bicycle maintenance classes to boys and girls who attend TYS. Bikes serve as the primary mode of transport for many of these children who live far from school and depend on their bicycles to get to class. Local bike shops, Hoff’s Bikesmith and The Hub, have made critical and generous donations of tools and components to make this element of the project possible. Students will also teach English and math in the primary school at Cape Three Points. To help facilitate teaching, the group fundraised for and purchased English level readers for elementary school children that will be donated to Cape Three Points primary school. Finally, the group will work to further develop the community garden at TYS, which provides fresh produce to the school. The nearest major market is more than two hours away by car.